Today I would like to share with you a "telescoping" card. Once you see how the mechanism works, these cards are really fun and easy to create. 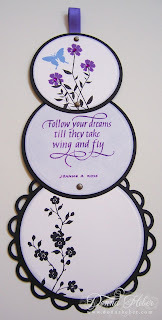 For this project you will need colored and neutral cardstock, brads, a hole punch, ribbon, stamps and ink to decorate, and several Big Shot dies or the Circle Scissor Plus. 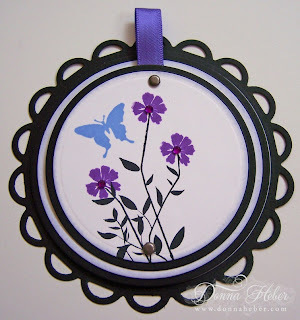 I have used my SU Garden Silhouettes set for the largest circle and stamped the image in StazOn Black. The sentiment from Quietfire Design was used for the middle circle. The stamp was inked first by loading it with VersaMark then Adirondack Purple Twilight and embossed with clear embossing powder and a heat gun. 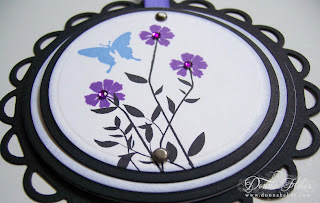 For the smallest circle I used the Memory Box Flower Bundle stamp. The stems were stamped in StazOn Black and the flowers in Adirondack Purple Twilight. The butterfly was stamped in Ballet Blue and is from SU's Essence of Love set. All the edges of the whisper white circles were sponged in Adirondack Cool Peri. Kaiser rhinestones in dark purple were added to the flowers. The piece of purple ribbon is from Ellen Hutson's store. For a tutorial on how to make telescoping cards, please visit Barb at Craft Chaos. Here is a link to her great You Tube video. The middle of the card. Oh, Donna, I love your telescoping card! I have seen these and want to make one! Yours is beautiful! You have given me the nudge and inspiration I need to create one! Happy Sunday! Super cute! 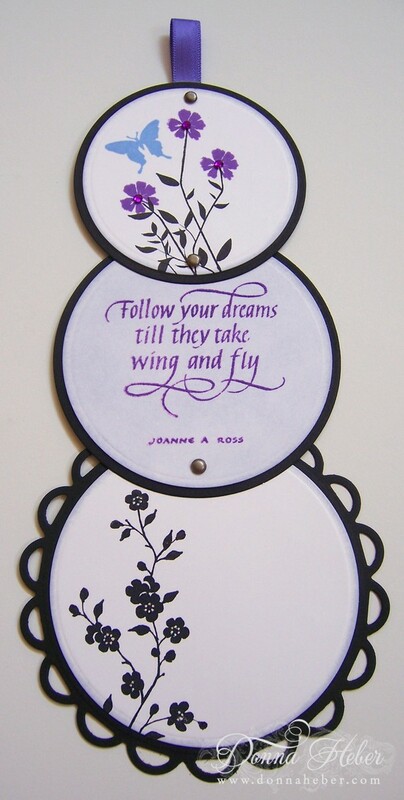 Fabulous idea and I love the purple colors you used! wow donna, this is gorgeous. your flowers and text are great. also the colours you have used. Wow Donna! This is exquisite! 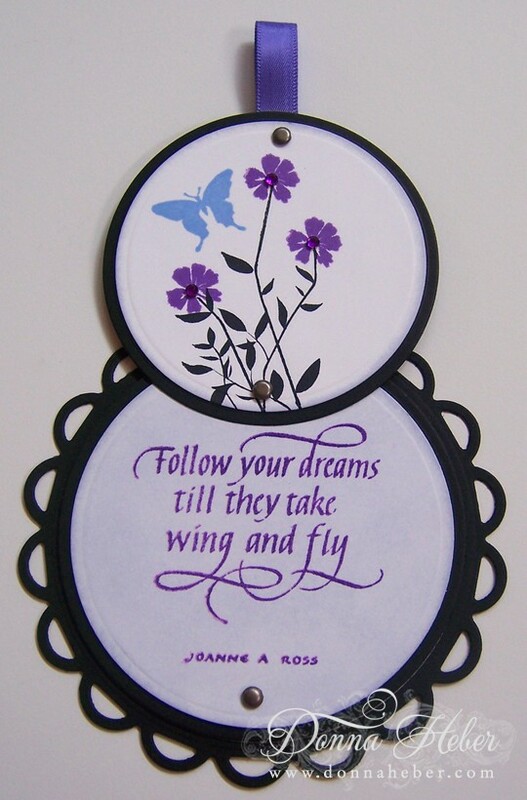 Thank you for sharing -love the quote, flowers and the colors you've chosen. This is very cool! I really like all the purple! Great card idea. Beautiful card Donna! Thanks so much for using the Quietfire Rubber stamp! You invent such great cards. What an intriguing card. Your design and color combination is stunning. Thank you for sharing the idea. I'm going to have to give it a try. What a neat project! Thanks so much for sharing this. I always walk away from your blog relaxed and inspired. What a neat idea!! Love this card.